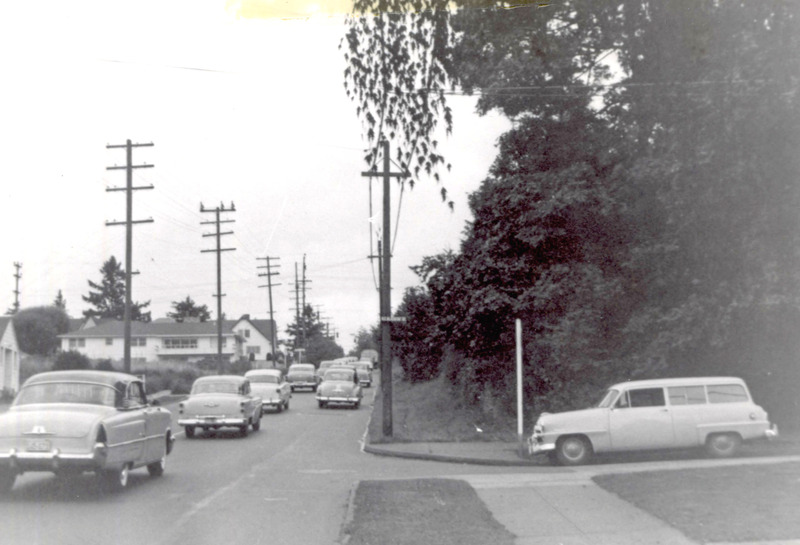 Much of Northeast Portland at the turn of the last century went like this: a sparse grid of dirt roads, brushy open fields, clumps of thick forest, a scattering of orchards planted in the 1880s and 90s, limited central services, a few established rural residences, and houses with newcomers popping up here and there as the real estate business percolated. And dairies. 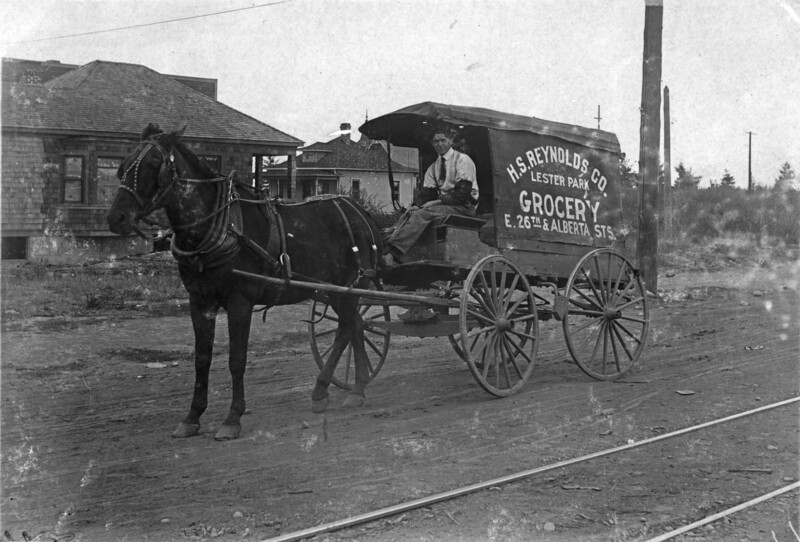 Portland’s fresh milk came from a relatively small number of commercial production dairies and hundreds of smaller operations scattered across the landscape—including right here in the backyards of neighborhoods we know today—consisting of a few cows and a small barn or garage. 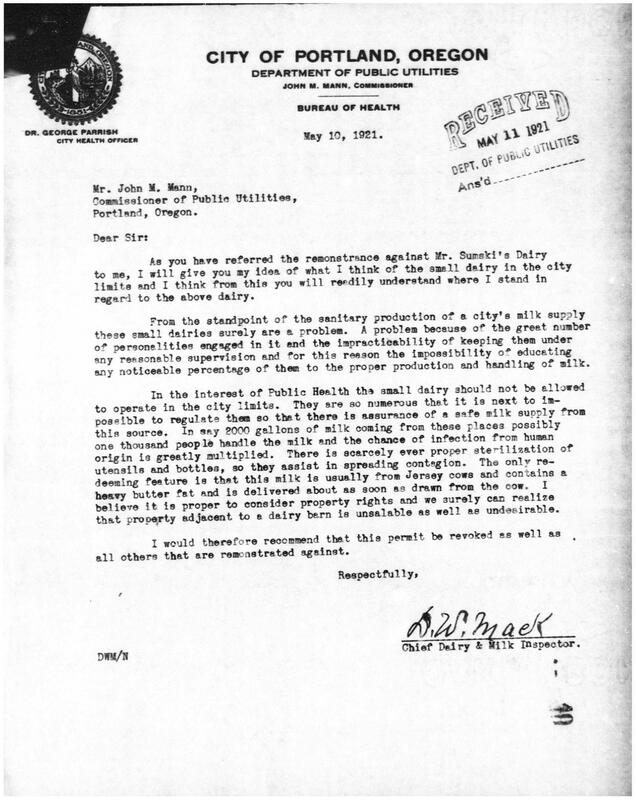 In 1914 there were 1,004 licensed dairies operating in Portland. 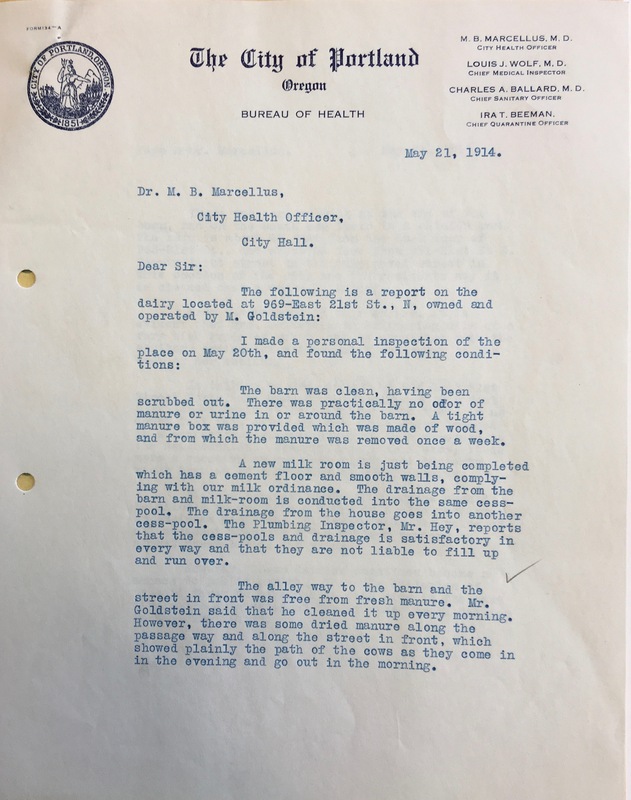 In his report to City Council that year, Mayor Albee worried out loud about just how many more small dairies didn’t bother to get a license. Our hunch is there were many. 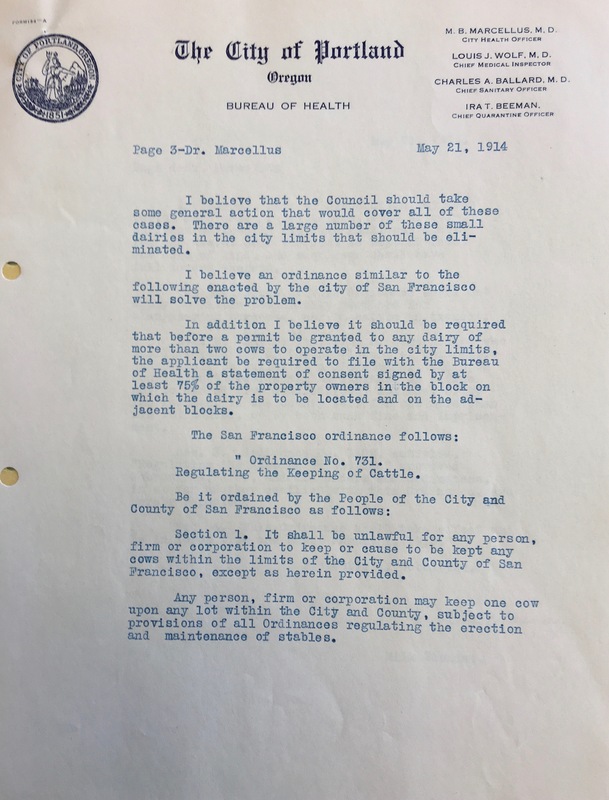 We know this for a few reasons: partly due to the trail of official documents required of dairy operators by the city, all still carefully filed away at City Archives. 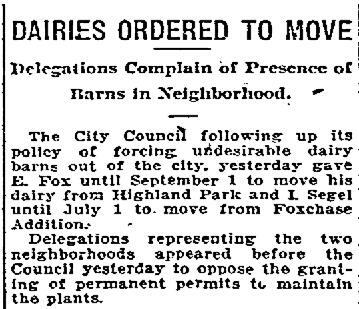 But also because as residential growth escalated in the 19-teens and early 1920s, neighbors and dairy operators came into conflict over the smells, sounds and hours of operation that were just natural to the dairy business. 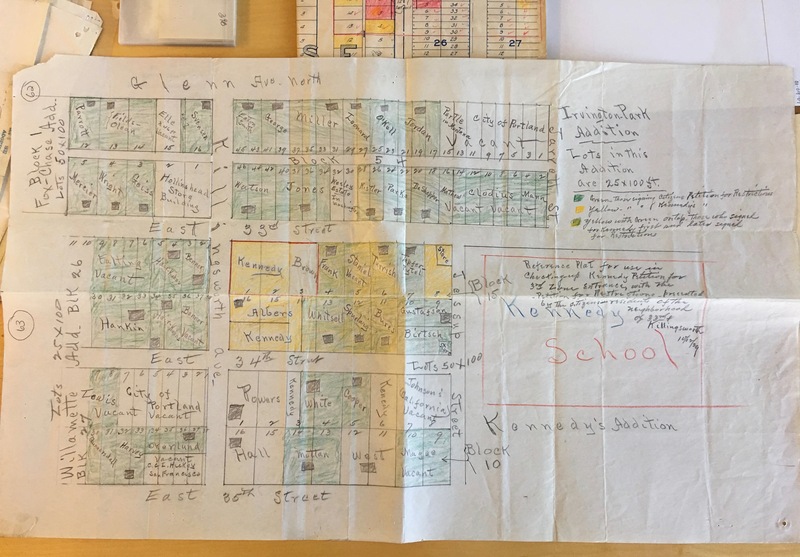 The leading edge of new neighborhoods as they were built formed a line of demarcation between an older way of life that involved open fields and agriculture and a new way of life with its grid and density of houses, people, schools and streetcars. 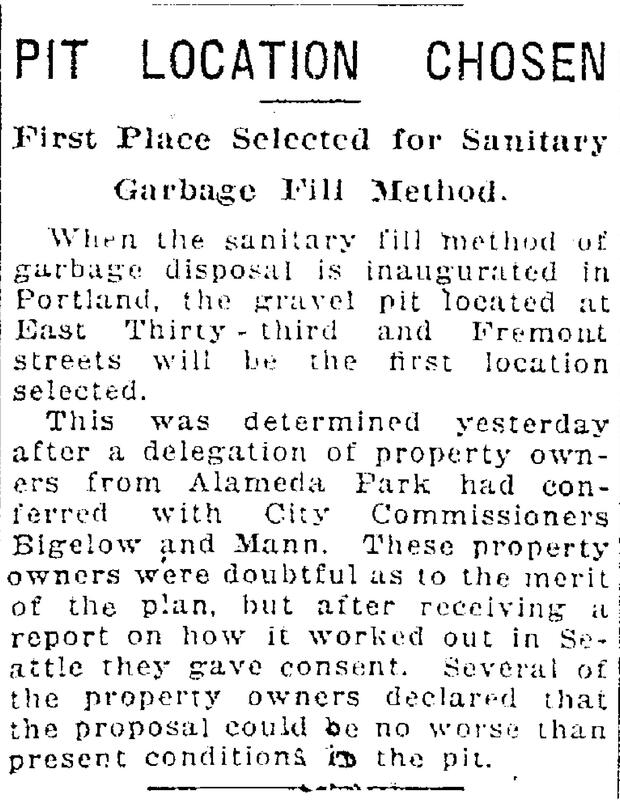 From The Oregon Journal, August 8, 1915. 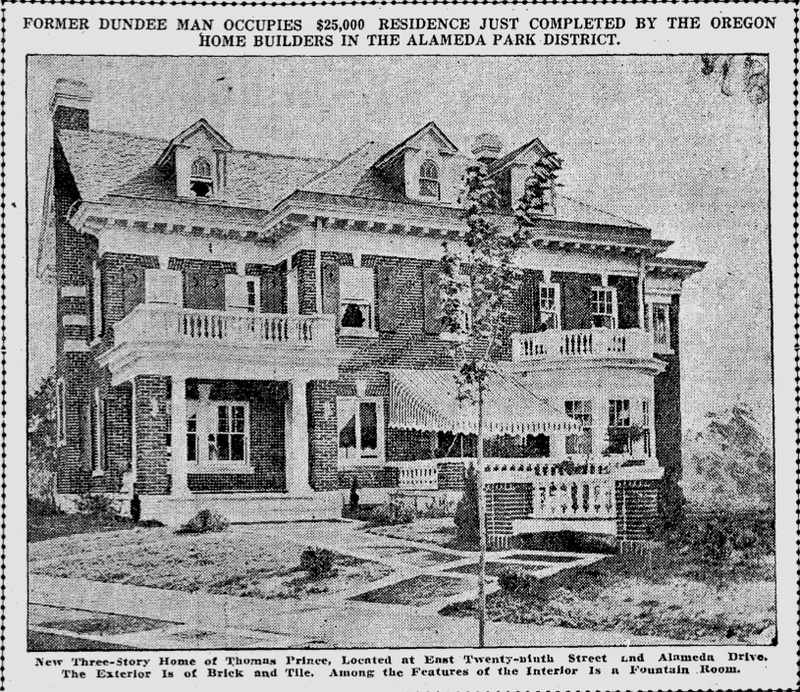 Ordinances about the proximity of out-buildings couldn’t really address the fundamental land use conflict of agriculture and urbanizing residential life, particularly when a dairy operator was walking the cows up the street past the neighbors to graze in a vacant lot for much of the day and rounding them up in the evening for milking in the shed out behind the house. 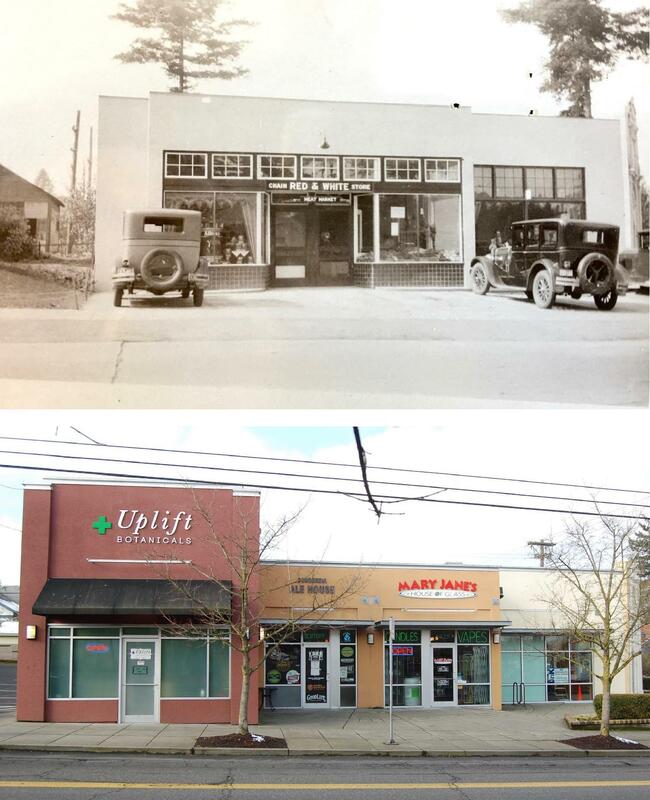 The dairy mentioned in the news story at 969 East 21st Street North (today’s 4539 NE 21st, remember Great Renumbering) was run by Lizzie Goldstein. 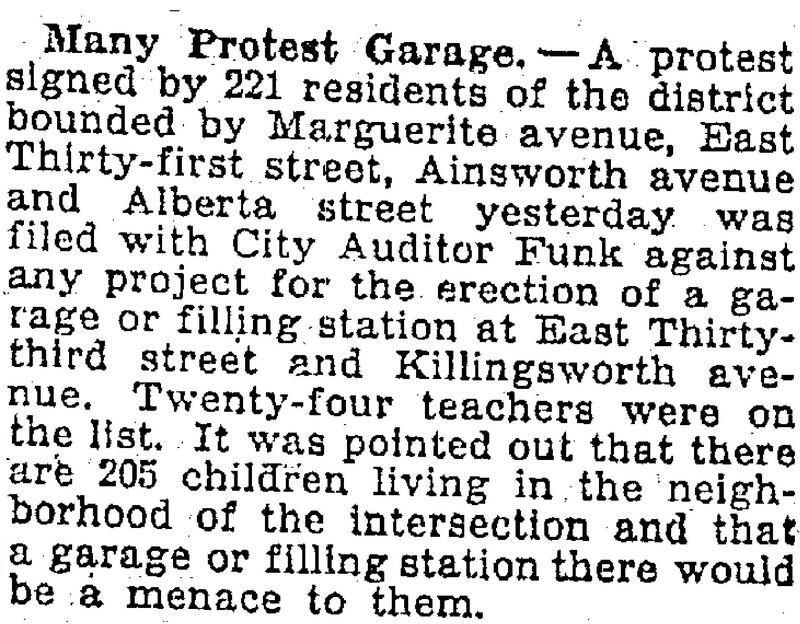 By 1915, most of the houses on that block were built and the street was a vibrant place. Here’s a view of the Goldstein house and block today. With some obvious modernizations, this street scene was pretty much the way things looked when the dairy operated out of a big barn out behind the house (which is no longer there). 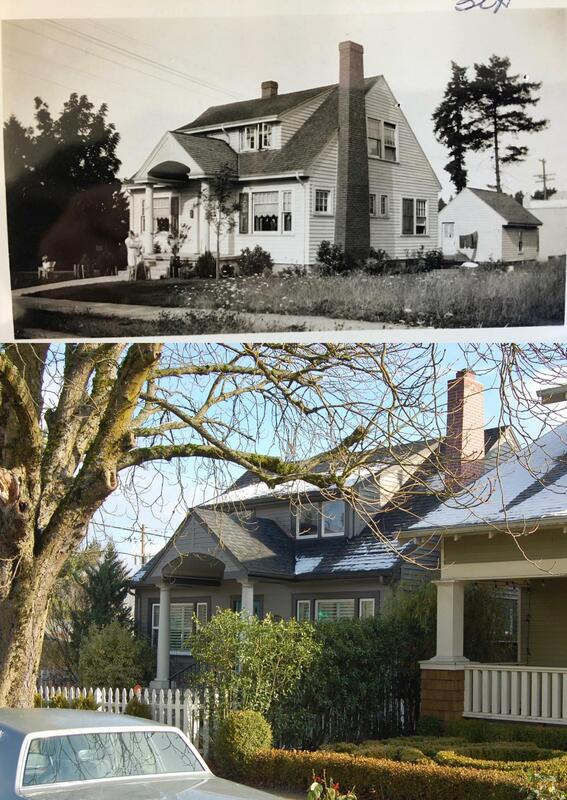 The former Goldstein house (center) at 4539 NE 21st, and the driveway where the cows filed in and out each day. The barn was at the back of the lot, directly behind the house. 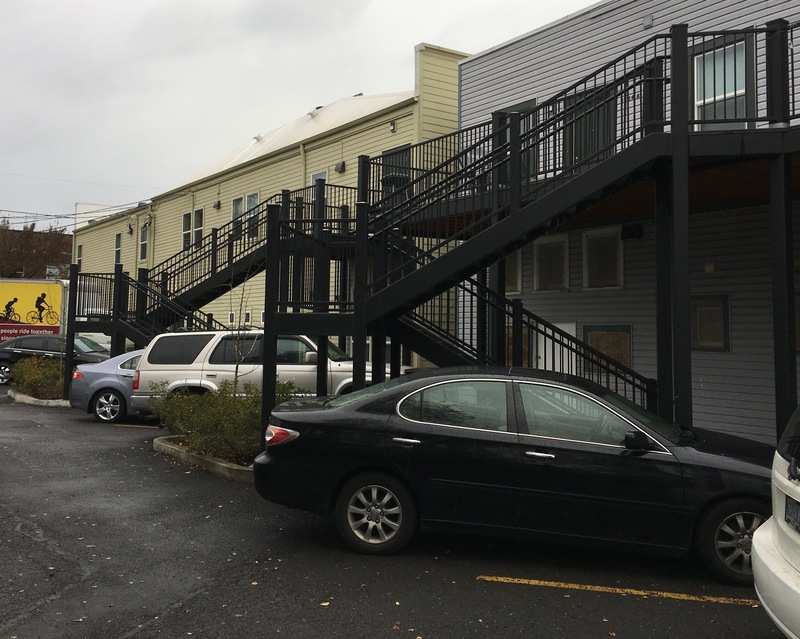 Neighbors in the houses to the left and the right filed complaints with the City of Portland over the noise and smell of the Goldsteins’ 10 cows. December 2018. 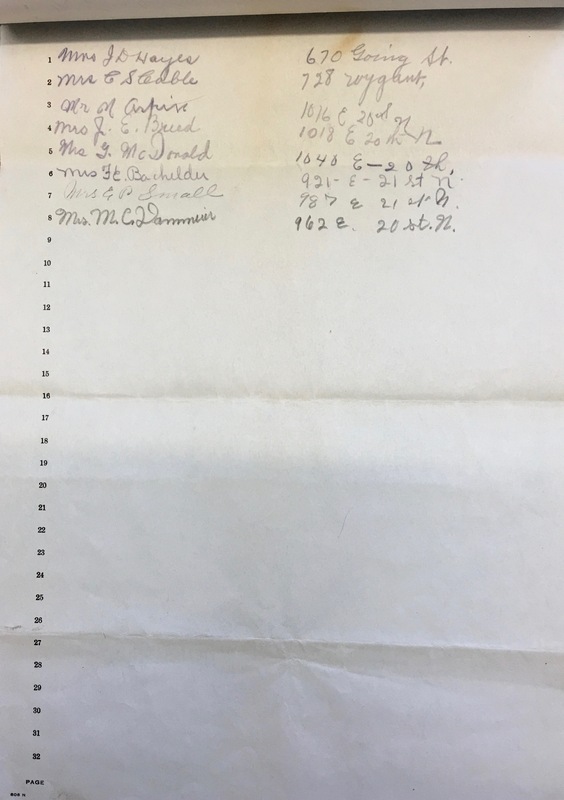 Confirming our belief that all things are somehow connected, the Goldsteins lived on the same block as the Alberta Shul, where they were members (which we’ve written about), and directly next door to the Vernon Practice House (which we’ve also written about). The imposing Old Vernon School was just a block over (when you read this, be on the lookout for the part about kids walking to school getting manure on their shoes). And don’t forget the bungalow grocery just up the street. Lots going on here off of Going Street. 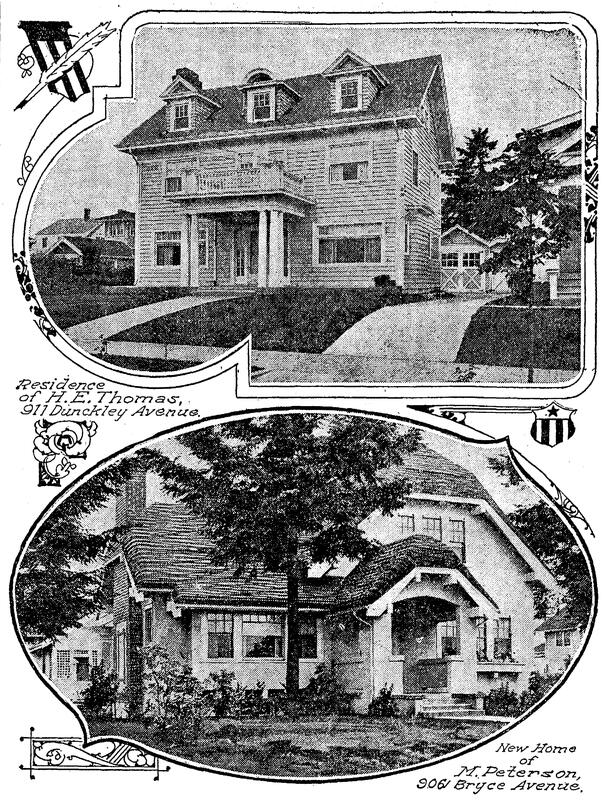 Lizzie and her husband Morris were Russian immigrants who became naturalized citizens in 1901 and moved in to their brand-new house in 1909 with their children Bertha (then age 11) and George (then age 9). Morris ran a store on Alberta and she ran the dairy. Evidently Lizzie knew her business well because milk from her dairy routinely won contests for quality. Did she grow up on a farm in Russia? Did you catch the language there on page two? 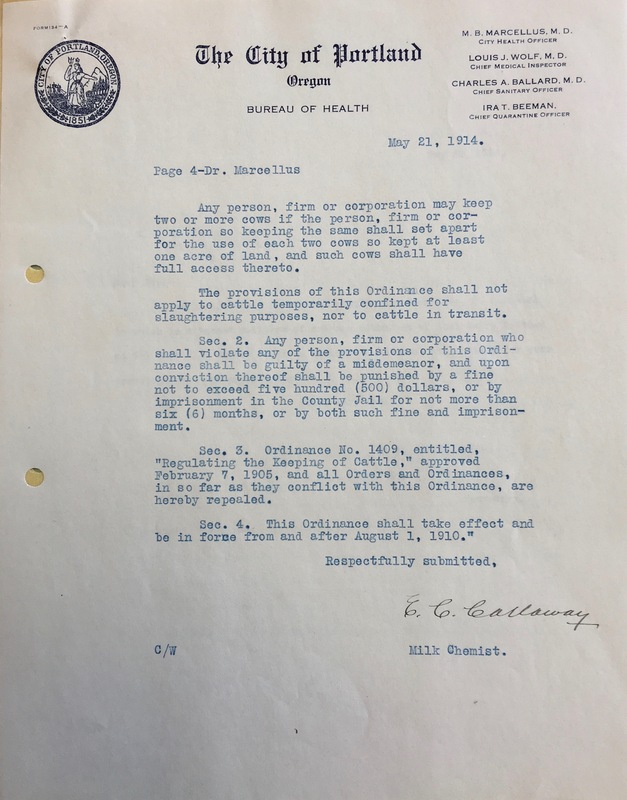 “It is a personal wrong that anyone should be allowed to maintain a dairy in a nice residence or business district.” And, “…these dairies sometimes become a menace to public health.” Pretty strong stuff. 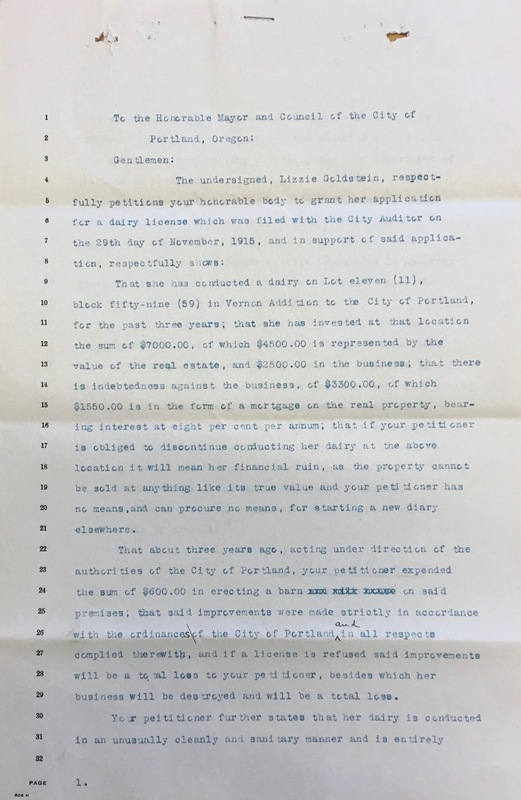 In November of 1915, in preparation for a pending City Council action on licensing her dairy, Lizzie brought her own strong case in the following petition to Mayor Albee and his council describing her investments made over time, all allowed by past city ordinances. Be sure to check out her fascinating signature. Can you imagine getting the signatures of 80 people in the neighborhood today to support something as impactful as a dairy operating next door or up the street? She must have sold a lot of milk to many happy neighbors. City council was in a jam: they were strongly pro-business and had after all passed policies that encouraged the kind of business investments Lizzie made in her dairy. 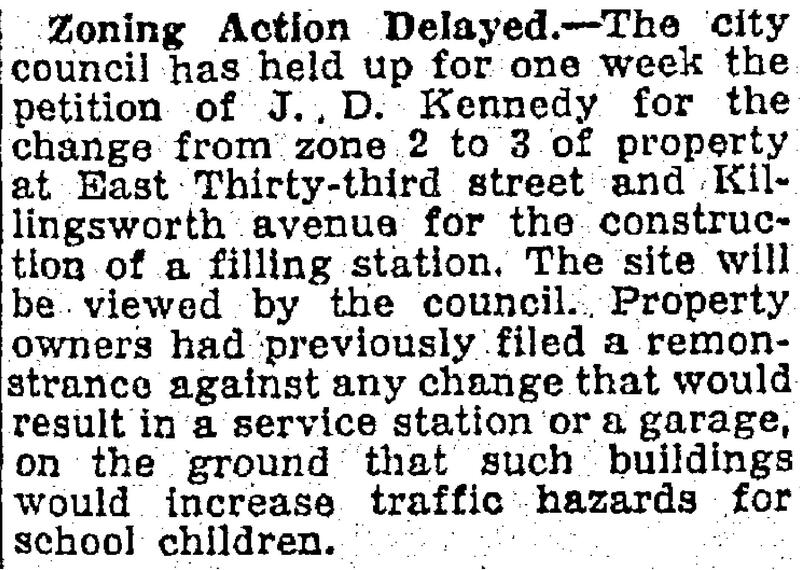 Still, they had citizens demanding action and a major livability and possible public health issue on their hands (and maybe on their shoes). 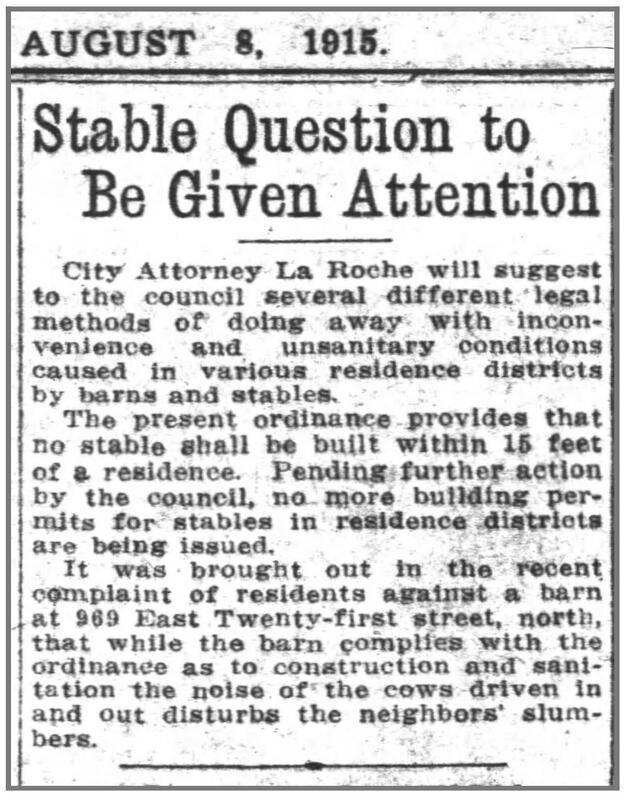 Throughout much of 1916, via continuance and delay, council kicked the can of decision making down the road about whether to relicense the Goldstein dairy. Meanwhile, a few blocks north and east, council was ordering other dairies closed. 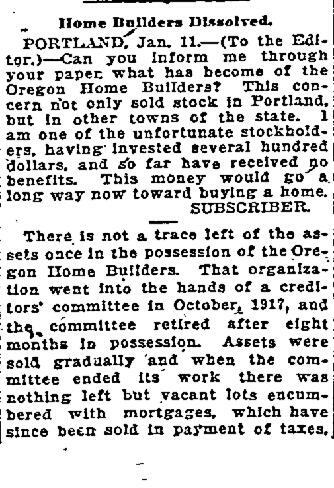 From The Oregonian, April 20, 1916. There’s no further reporting about the Goldstein dairy after that encounter, and nothing conclusive in city council proceedings or archives. 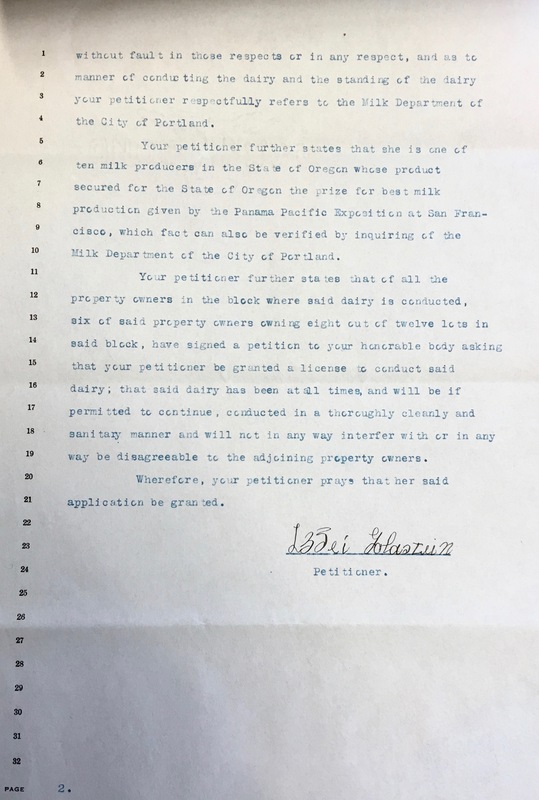 We examined every dairy license issued in Portland from 1916-1922, and Lizzie Goldstein was not among them. 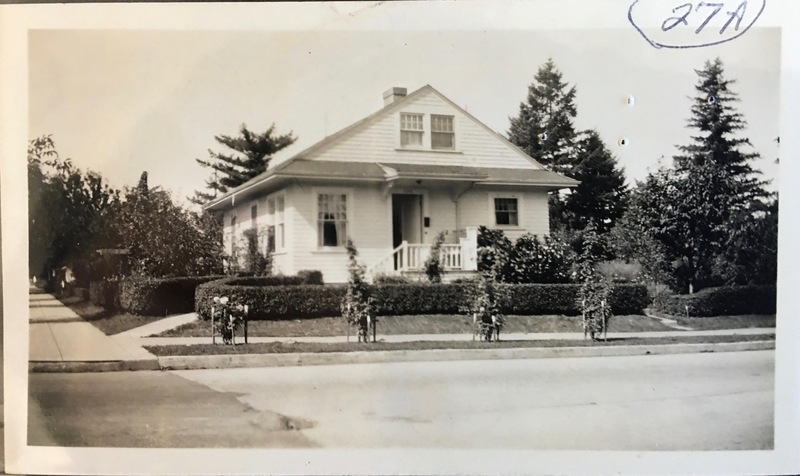 But she continued to operate for another seven years, winning contests and being listed each year in the newspaper as producing some of the very highest quality milk in Portland from the dairy behind her house. Lizzie must have decided she just couldn’t quit the business, and had the last laugh in the face of the city’s weak enforcement mechanisms. In 1920 she even placed a classified ad for a milker to help out around the place. 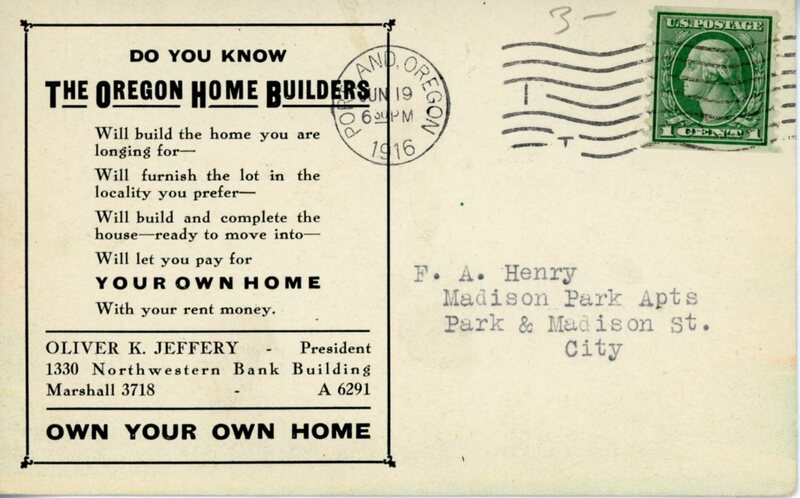 But the tide of urbanization crested in the early 1920s (1922 was the busiest year for home construction according to building permit research we’ve done) and the pressure on the Goldsteins must have been overwhelming. 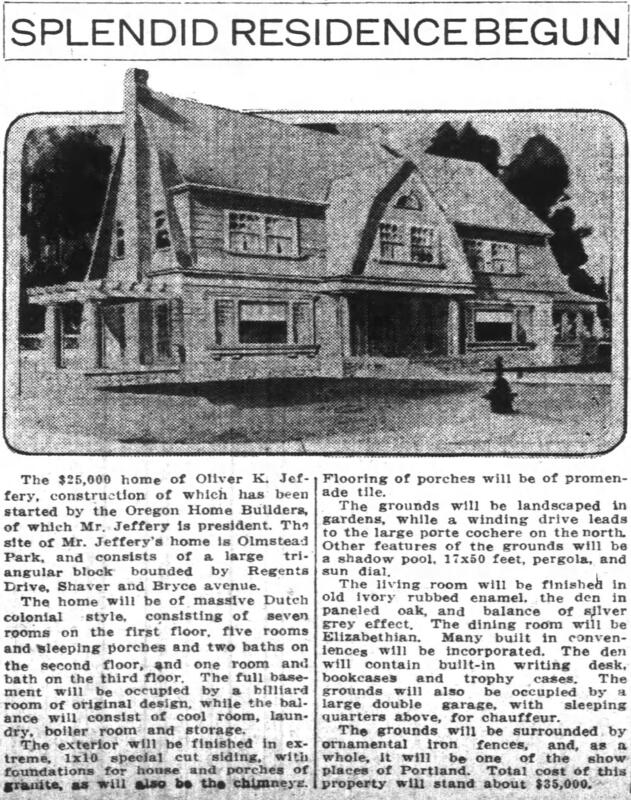 By 1923 they were making other plans and put their home up for sale, the classified ad referring to the former dairy barn out behind the house as a “garage for 4 machines,” meaning autos. Not milking machines, or cows. With the Goldsteins’ departure, the days of urban dairies in this neighborhood were done. City council was thinking deeper thoughts about planning and zoning, street paving eventually came along, the residential real estate business exploded building out most vacant lots, and the Alberta business district was going strong. No more room for cows. 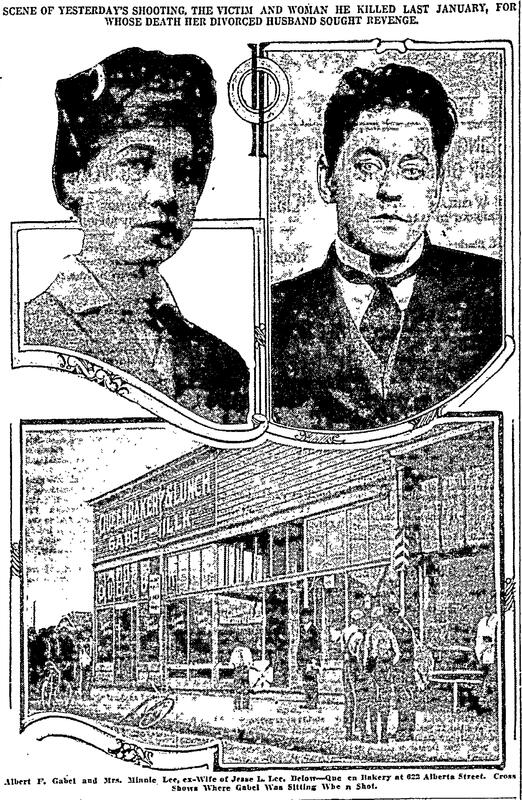 Lizzie, Morris, Bertha and George moved to Kenton and took over a furniture business on North Denver Street. Our review of official dairy paperwork during those years shows a shrinking geography in which licenses were granted. 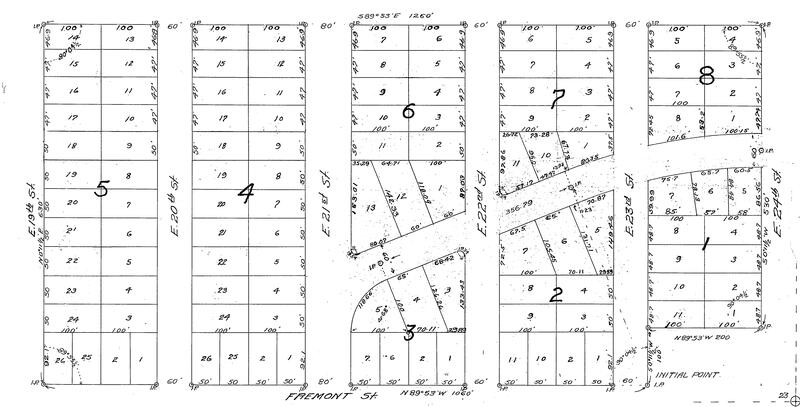 In yet-to-be developed areas like the open fields around today’s Fernhill Park and north and west of NE 33rd and Knott, licenses were granted for small operations of 3-6 cows. 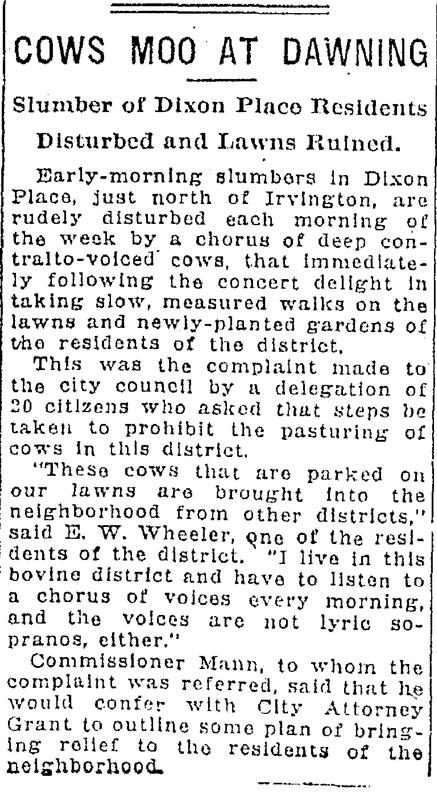 But in established young neighborhoods like Vernon, Concordia and Homedale, long-shot applications were usually accompanied by petitions from understandably cranky neighbors citing the obvious concerns: smell, flies, mess, and the bellowing of cows. 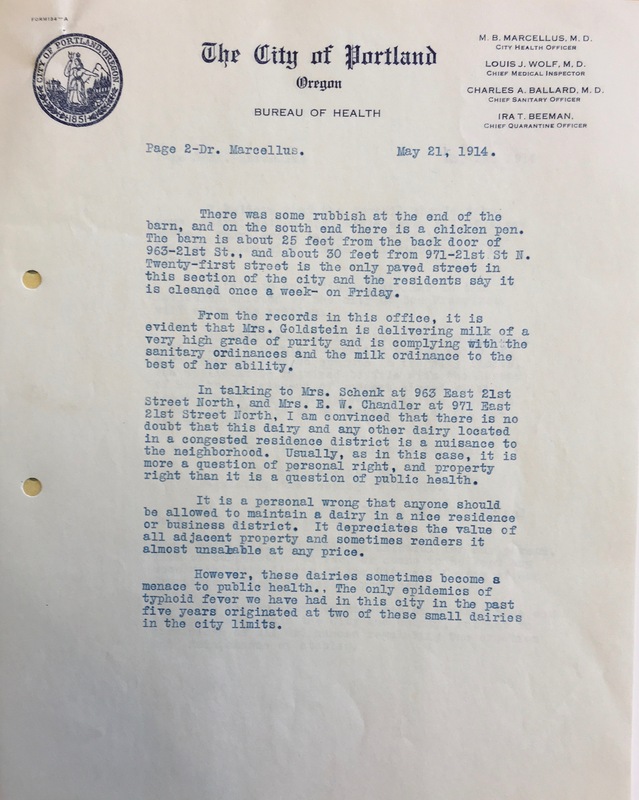 In a tragic postscript to this story, Lizzie was killed and Morris seriously injured in a freak automobile accident at NE 8th and Alberta on April 19, 1925. They were riding in an auto that was hit by another car and pushed in front of the Alberta streetcar, which could not stop and demolished the Goldstein car. Her memorial service was held two days later in what must have been a packed Congregation Tifereth Israel (Alberta Shul) just around the corner from the former Goldstein home and dairy. 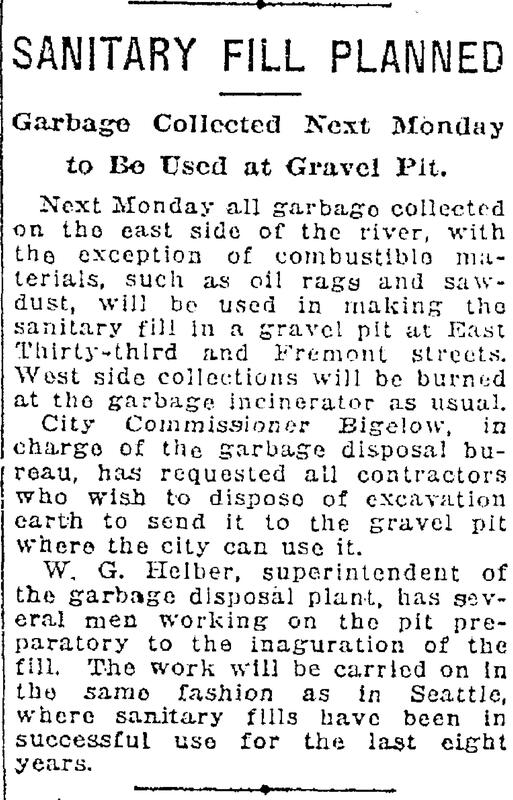 Down the years, on the anniversary of her death, Bertha and George published memorials in the newspaper in her honor. 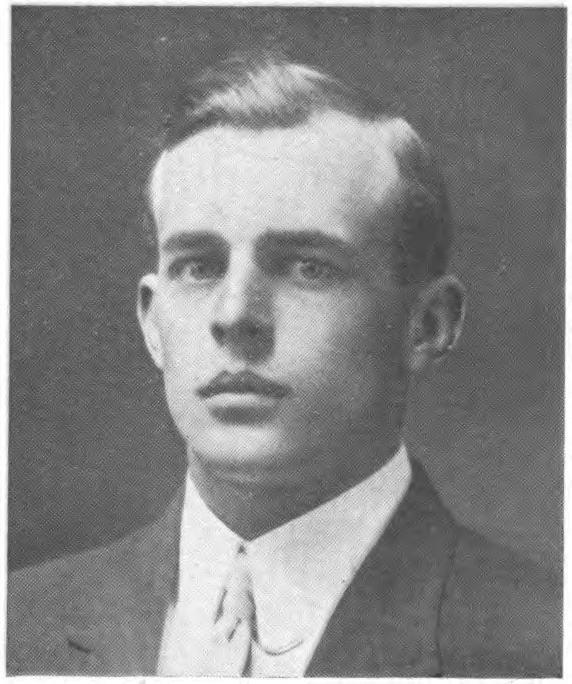 Morris died on June 23, 1933. 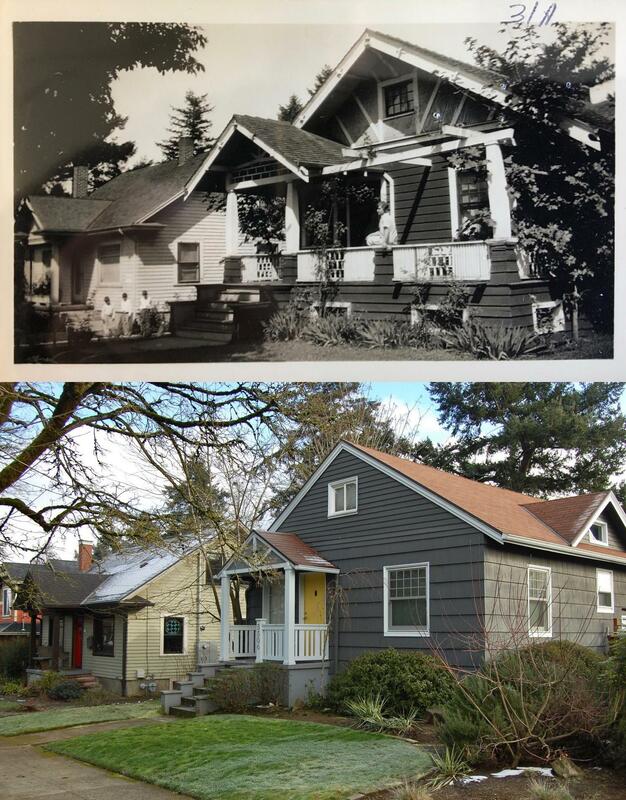 Both are buried in the Neveh Shalom cemetery in southeast Portland. 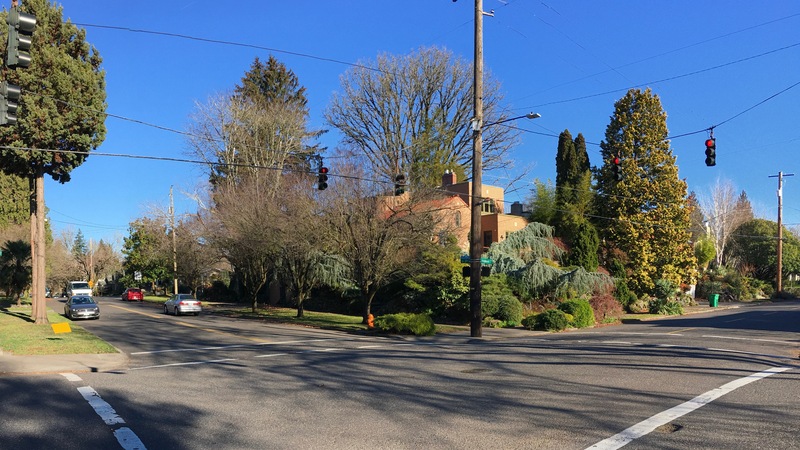 Homedale is the name of the property plat—once part of an orchard and dairy—that occupies the landscape bounded roughly by Fremont and Ridgewood, between NE 19th and NE 24th. 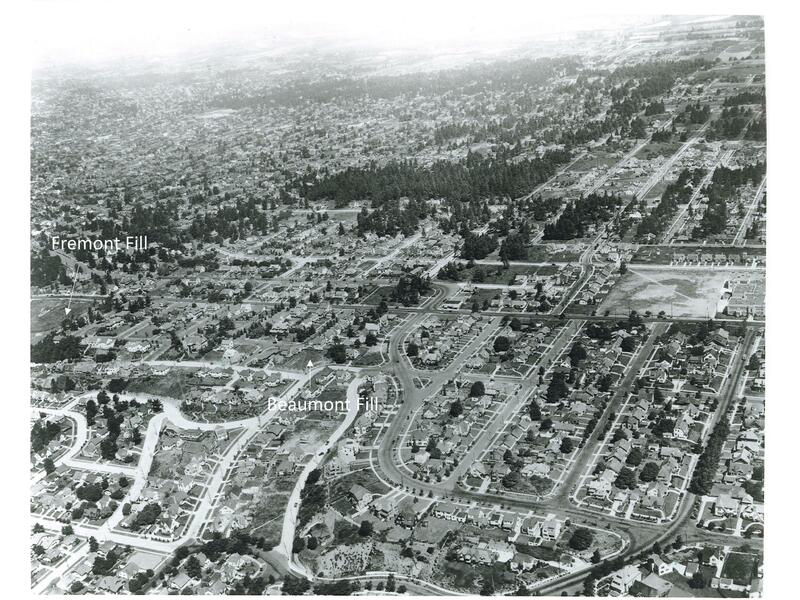 Today, it’s considered part of the Alameda neighborhood. Here’s a look at the geography. 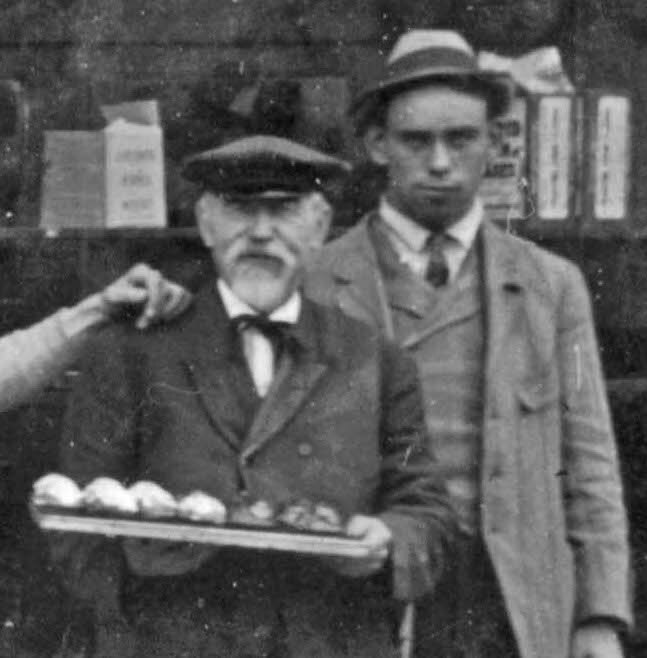 Detail from the Homedale Plat, filed in 1921. Click to enlarge. 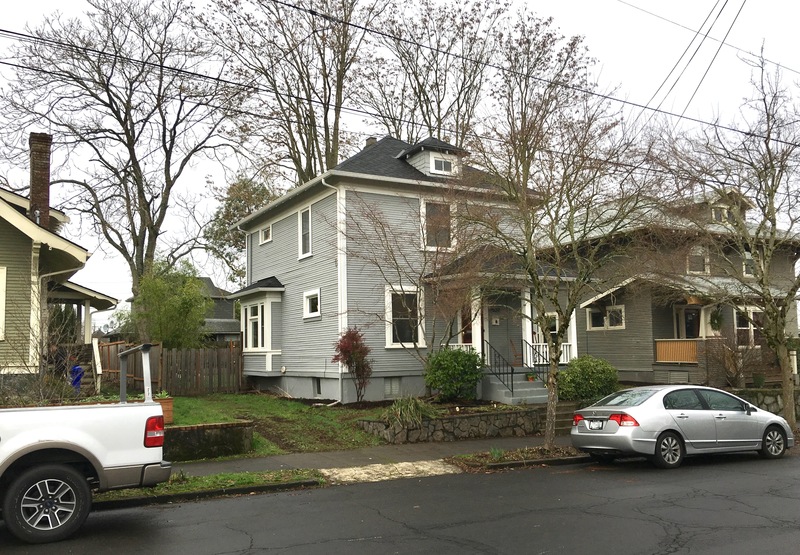 Think of a plat as a road map filed by developers for organizing property into individual lots and streets (read more about the relationship between plats and neighborhoods here). We all live somewhere in a plat and each has its own unique story, players and moment in history. We’ve created a category here on the blog (The Plats) to hold our ongoing exploration of these stories. 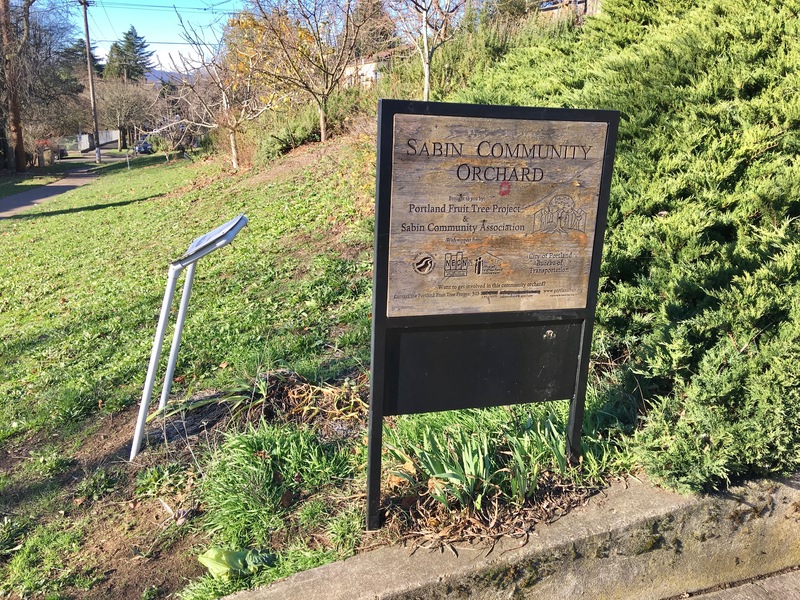 The once and future orchard, near NE 19th and Mason, December 2018. 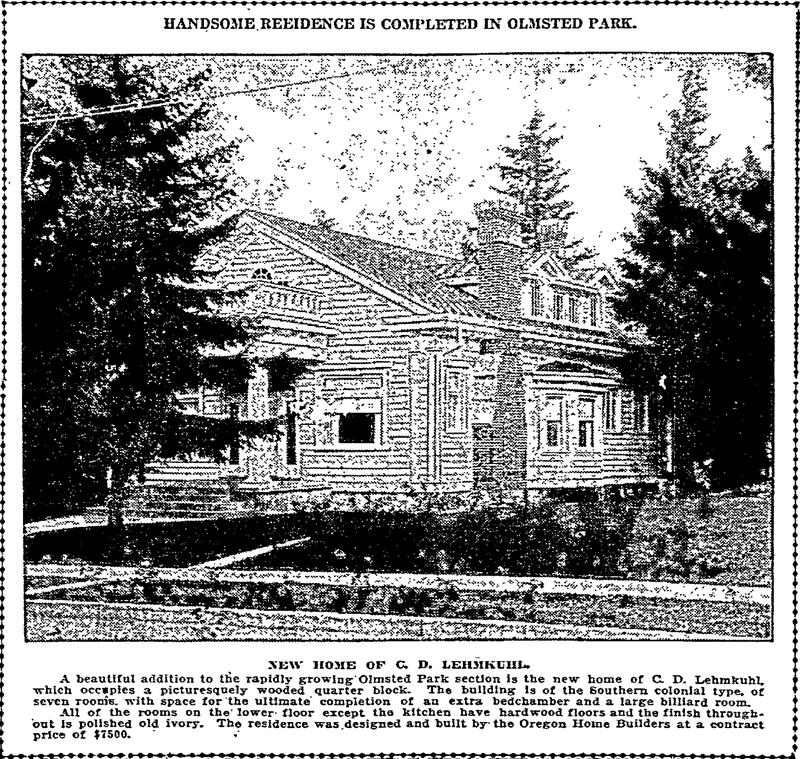 Owners Michael G. Munley and James T. Barron bought the future Homedale property in 1905 for $6,500 and kept it in agricultural use with an eye to eventual development, but market conditions didn’t make that worthwhile until the 1920s. Not coincidentally, Munley was son-in-law of E.Z. 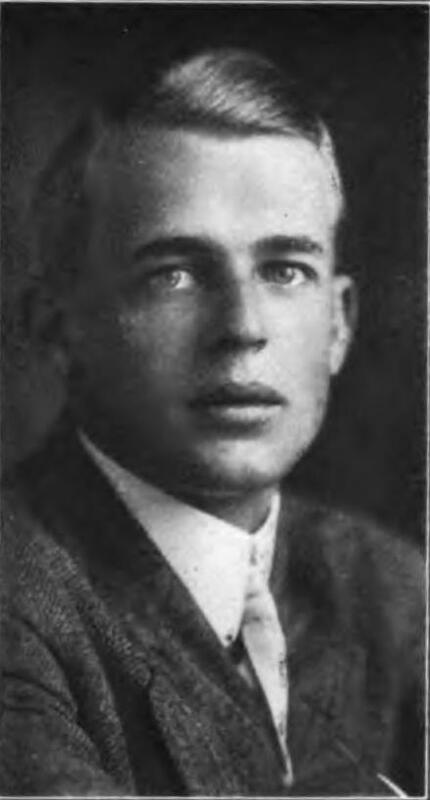 Ferguson, president of the Alameda Land Company which owned land just up the hill. Barron was a Ferguson business partner. 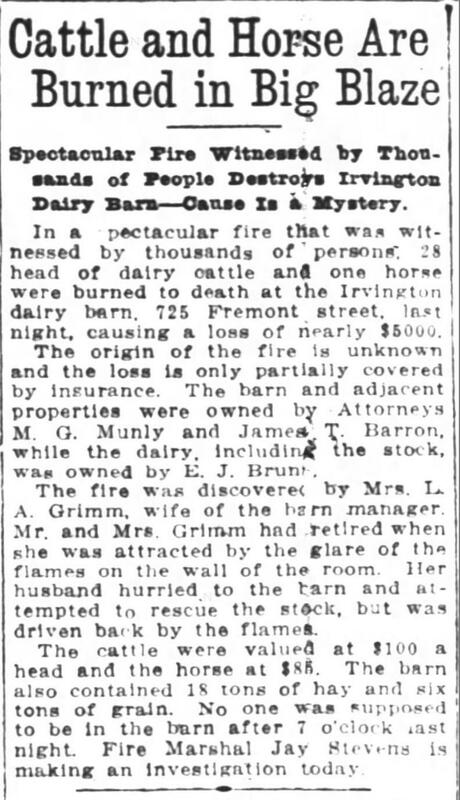 The Irvington Dairy operated from a barn situated at the northeast corner of NE 21st and Fremont from the 1890s until 1916 when a catastrophic fire destroyed much of the herd and the barn. 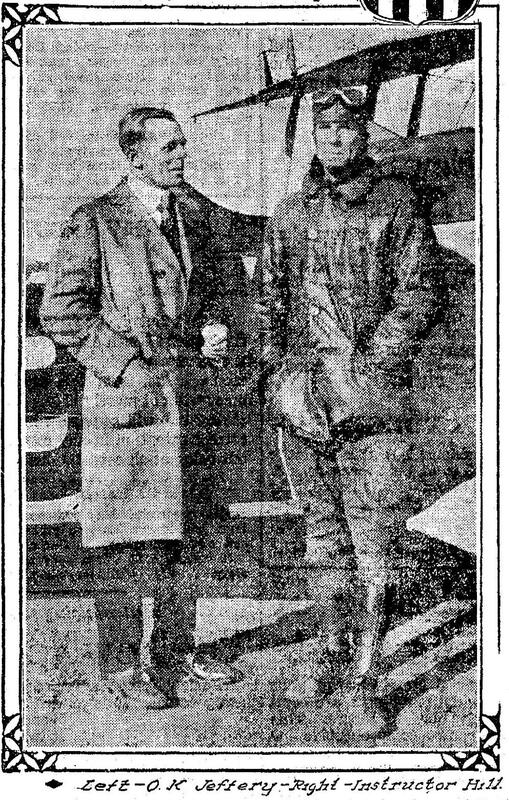 From the Oregon Journal, January 11, 1916. 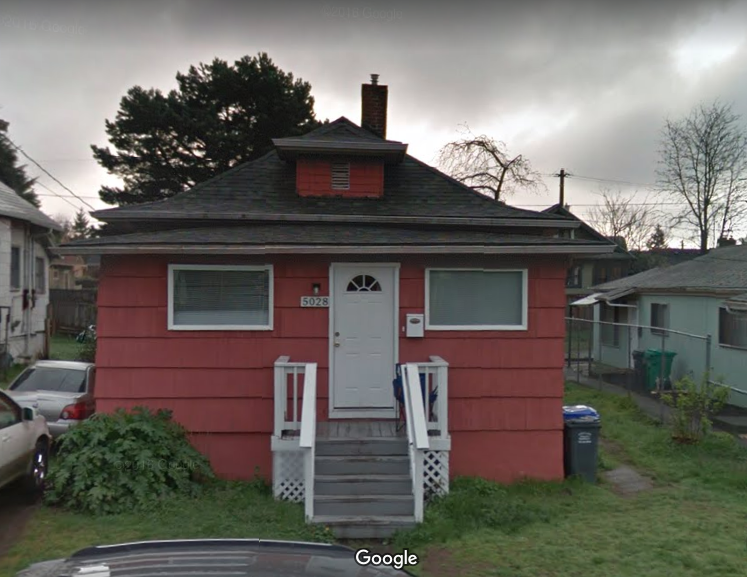 The address given–725 Fremont–is from Portland’s old addressing system and translates into the NE corner of 21st and Fremont. We did not find a follow-up news story about the fire investigation. The house remembered by Rod Paulson was home to dairy manager Grimm and his family. Location of the former Irvington Dairy barn at NE 21st and Fremont, looking northeast, December 2018. 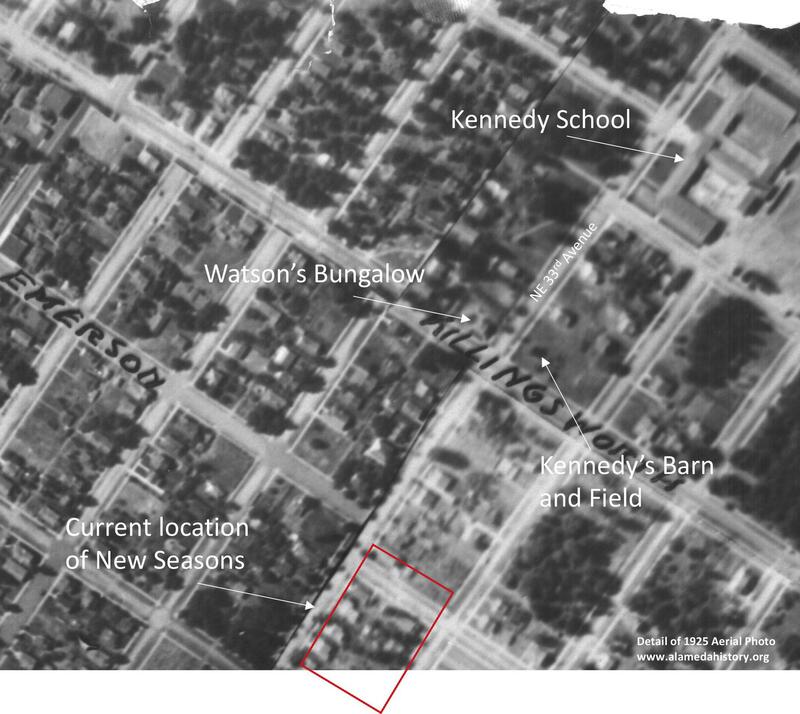 A nearby dairy existed just to the east as well: the Pearson Place, the cow pasture where Alameda School was eventually built. 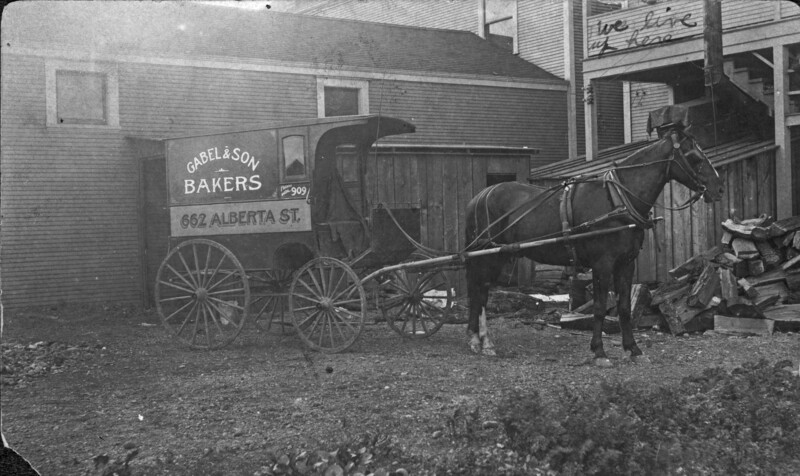 The Pearson family operated their dairy there during this same time period and it too was subdivided into residential lots about the same time. 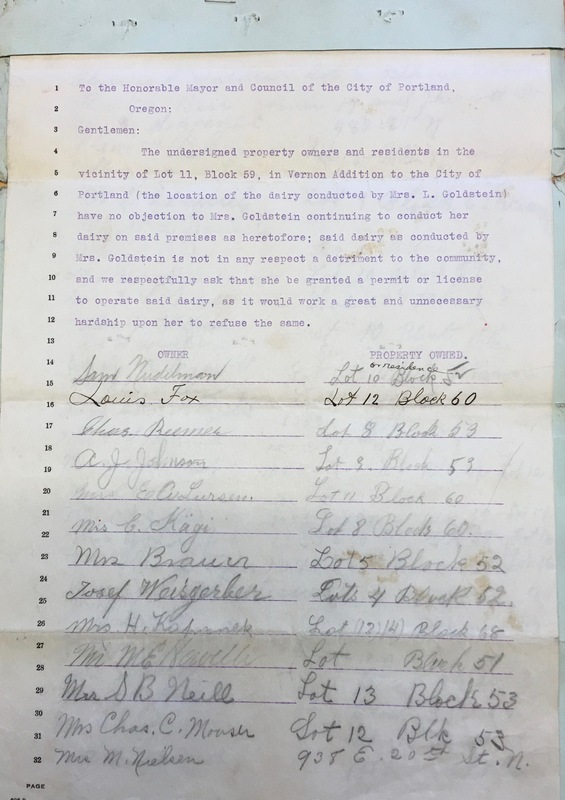 You can read more about the Pearson Dairy and its time-traveling tree here (and we recommend putting on your walking shoes and your imagination to walk the perimeter of the farm). By the fall of 1922, the streets of Homedale had been carved into the south-facing slopes and the first homes had been built. 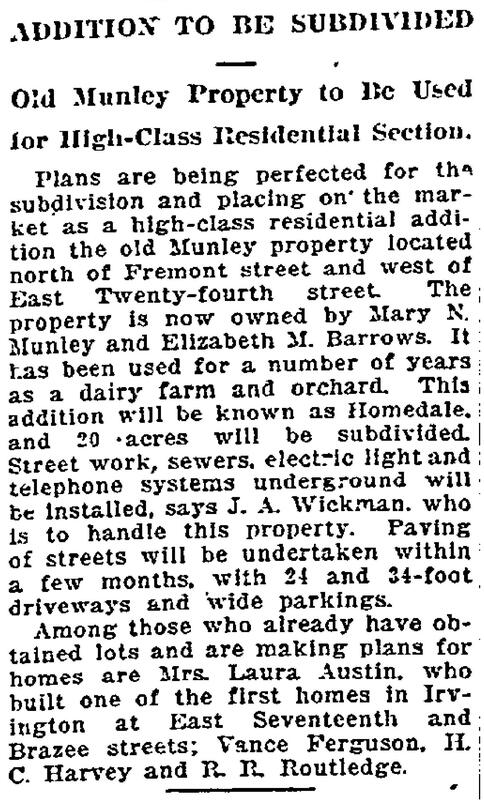 Real estate ads even mentioned without explaining why that most lots had a fruit tree (but no mention of cows). 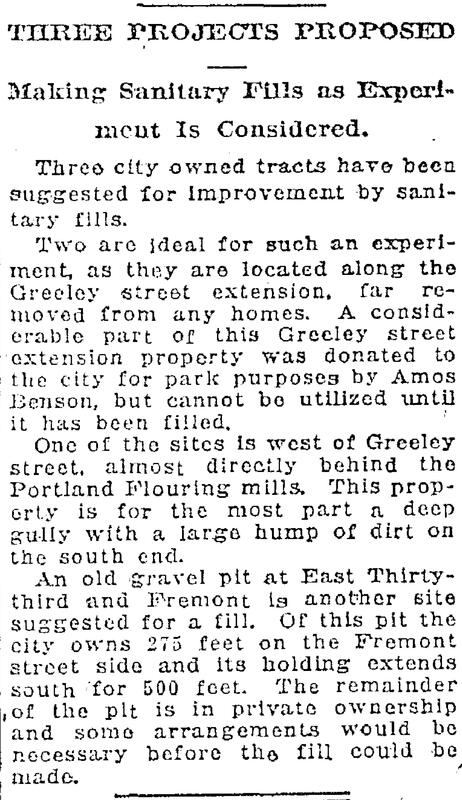 Interesting to note that prior to 1922, Regents Drive did not go all the way through to NE 21st because the orchard and open fields were in the way. Regents came down the hill and tee’d into NE 24th before heading south. 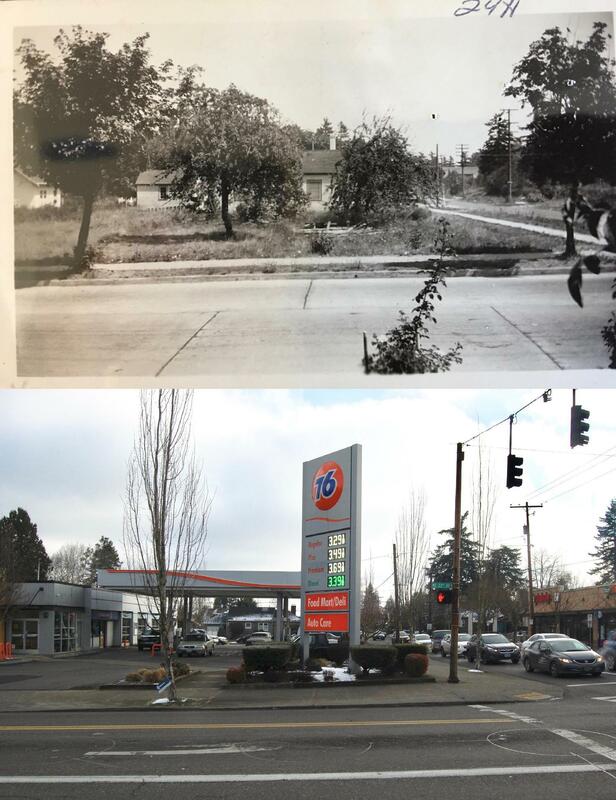 Think of that next time you drive down Regents headed for NE 21st: the former orchard and pasture land you’re driving through. 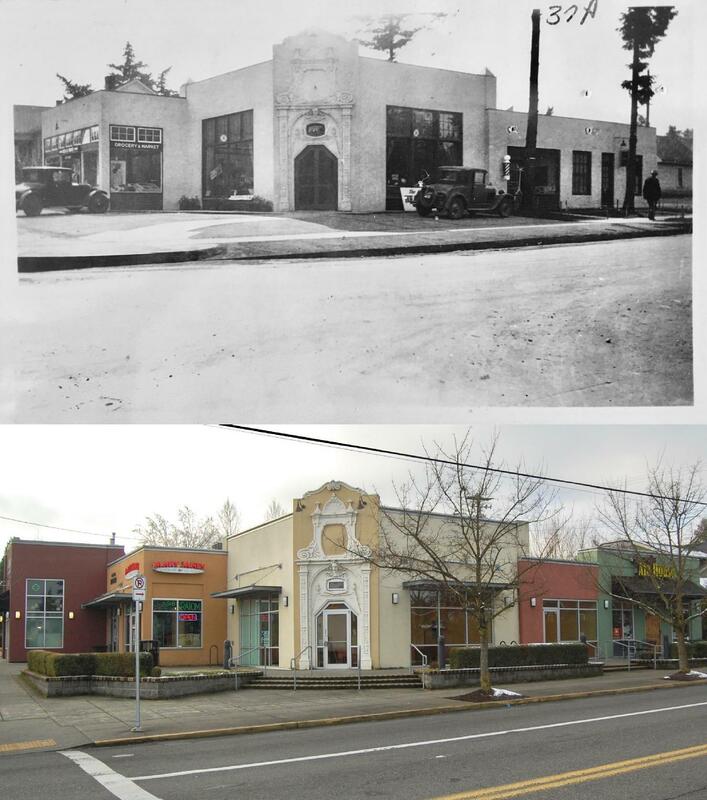 Dairies like the one at NE 21st and Fremont–and many more small dairies around town–occupied a unique niche in time as Portland grew between 1890 and the 19-teens. As population and growth exploded and property became more valuable for housing, the departure of the dairies was a bellwether of change. More from the front lines of subdivision-dairy conflict here. It’s a fascinating story. 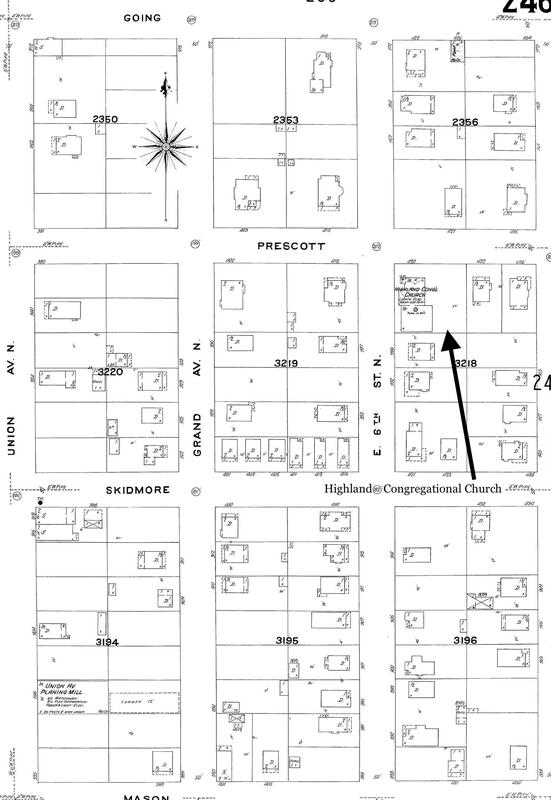 If you’ve traveled the west end of NE Prescott recently, you’ve seen lots of activity around the old church at the corner of NE 6th and Prescott. 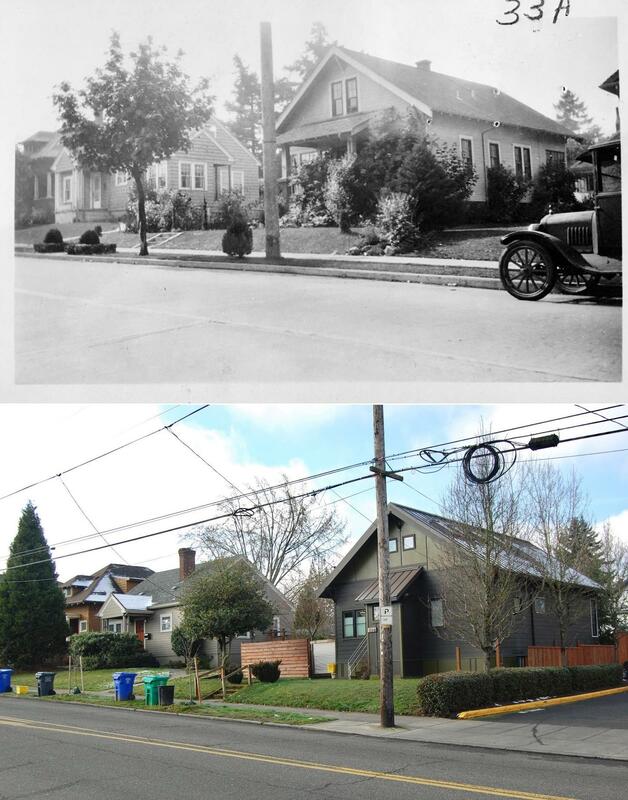 We know it today as the Portland Playhouse, but it started out life as the Highland Congregational Church on January 3, 1904. Portland Playhouse, 602 N.E. Prescott. November 2018. 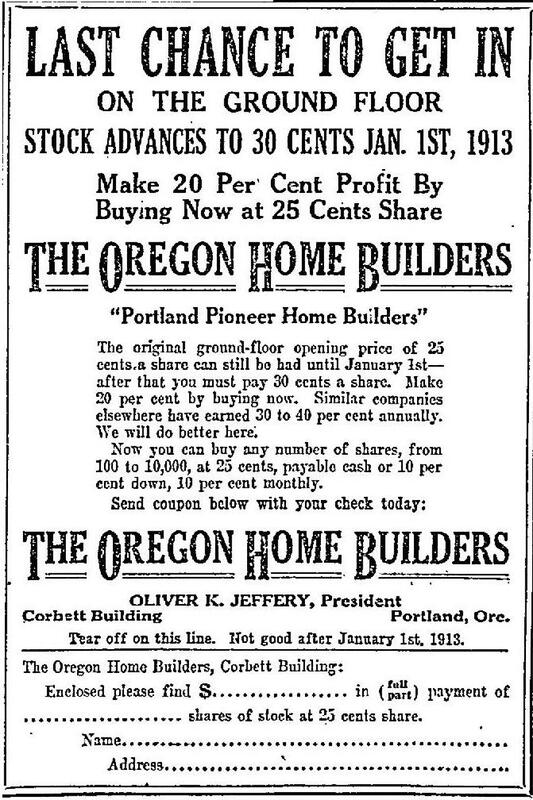 From The Oregonian, January 4, 1904. Note the original steeple cap. 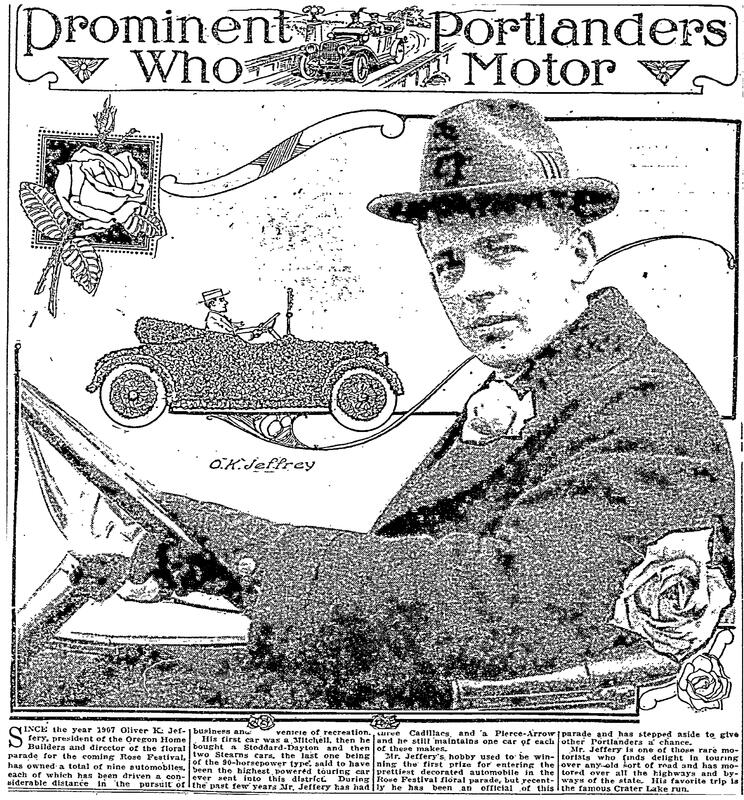 A news story in The Oregonian from January 4, 1904 reported that its founding pastor, The Rev. D.B. Gray, explained to his new congregation that the building cost $4,709.15 to build and the two lots it sits on cost $800. 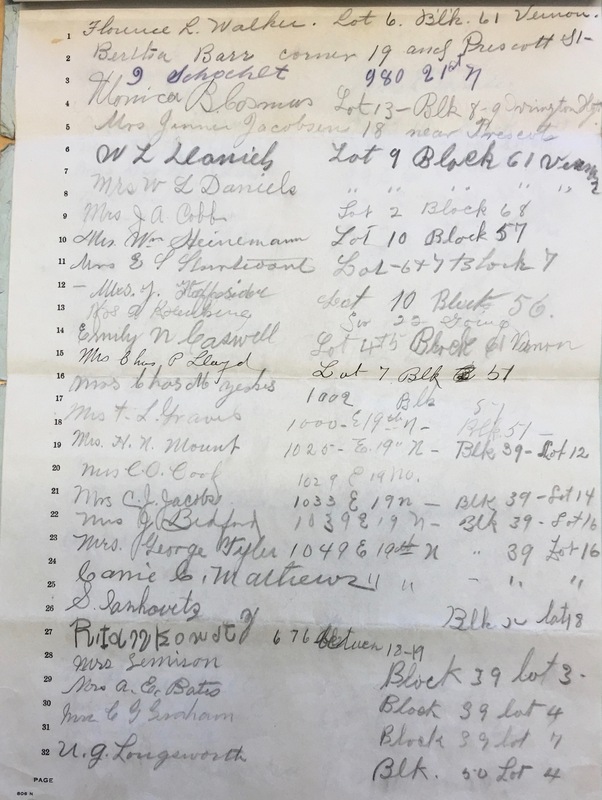 The community raised $600 of the total and the Oregon Missionary Society provided the rest. 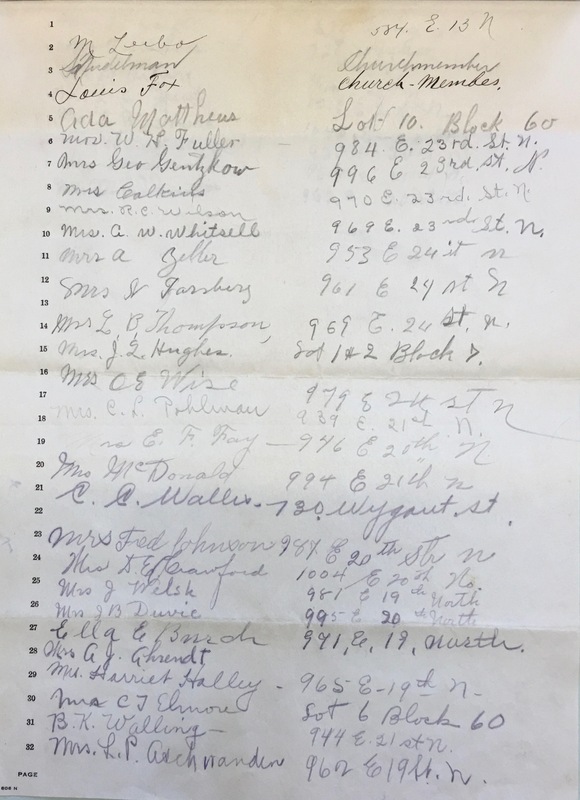 The Sunday school associated with the church had 150 children. Plans for the church were furnished by L.B. 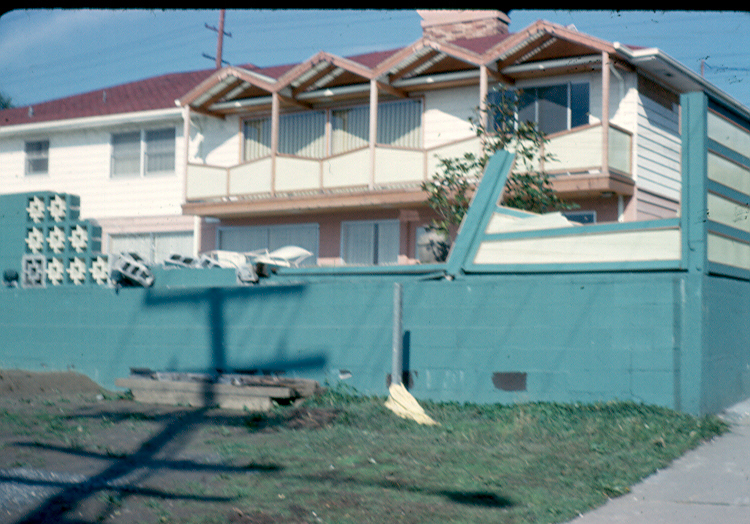 Volk of Los Angeles, California and Peter Wiser was the builder. According to The Rev. Gray, the building is modeled after the Mizpah Church at East Thirteenth and Powell streets. Capacity was about 300 people, with room left for future expansion. Original interior finishes were natural wood. 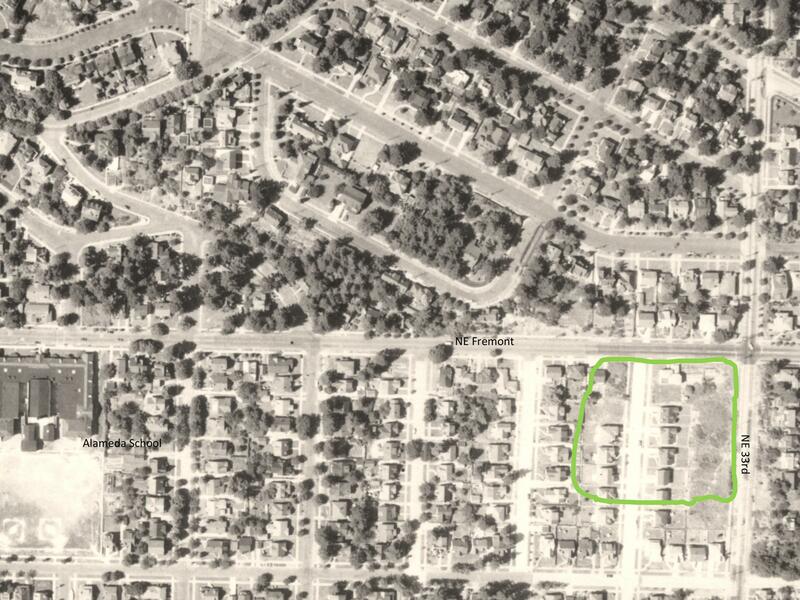 In 1904, this part of town was the eastern edge of Portland. Roads were dirt and the farther east you went, the wilder and brushier it got. 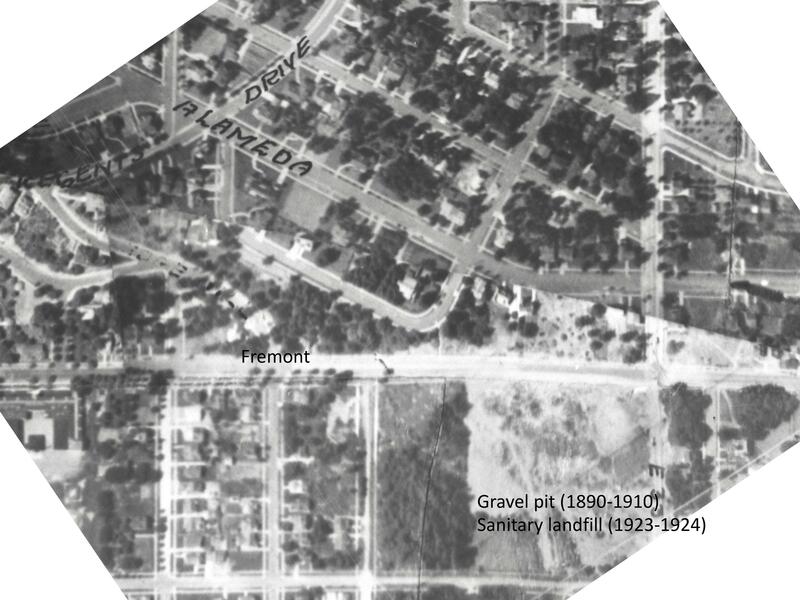 The Broadway Bridge was still almost 10 years from being built, and central sewer, water and gas and streetcar systems were just working their way out to this edge of the city. 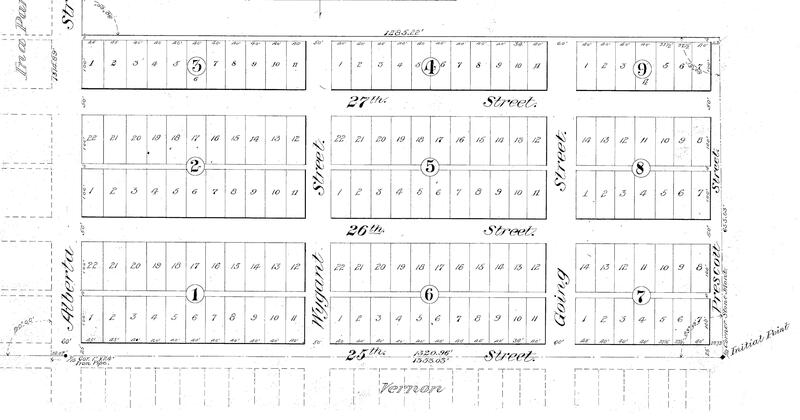 Here’s a look at the surrounding area–known then as the “Lincoln Park Annex”–in the 1909 Sanborn Fire Insurance Map. Detail from Sanborn Fire Insurance Map Plate 246, 1909. 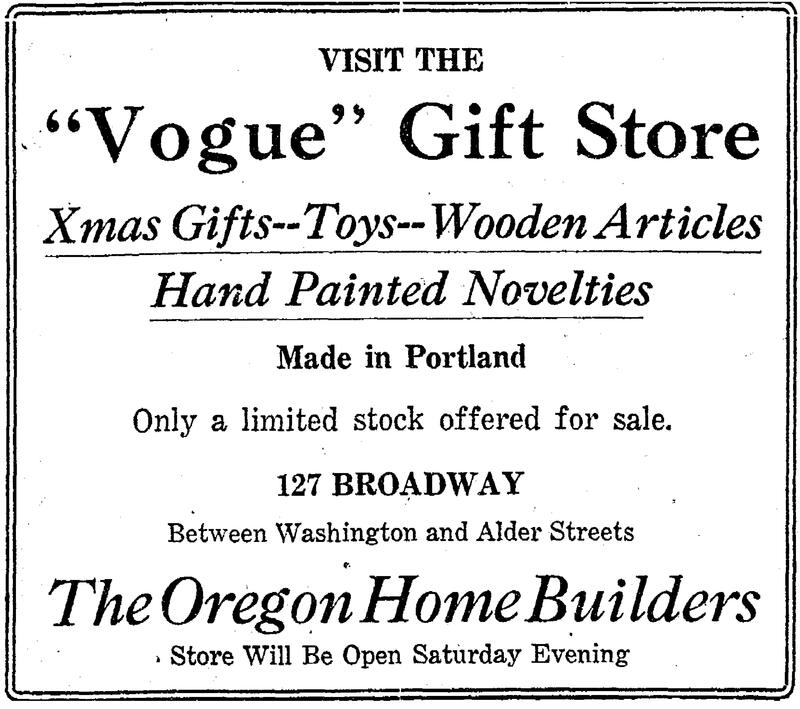 The address numbers you see here were completely renumbered in the early 1930s during Portland’s Great Renumbering. 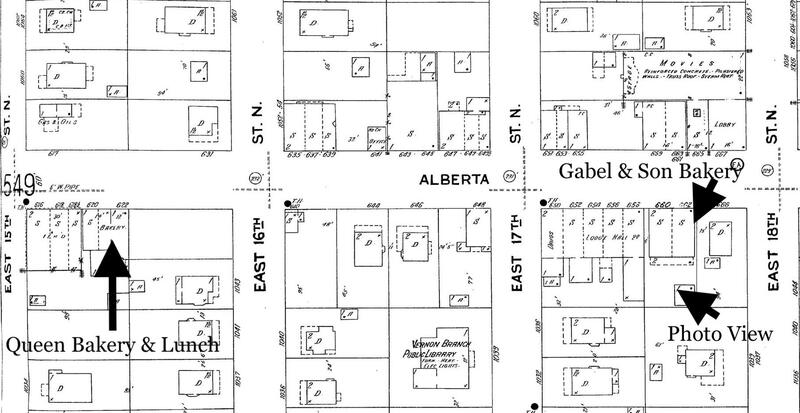 This part of the neighborhood was platted as the Lincoln Park Annex in 1891, an 18-square-block area gridded by a collection of unimaginative street names that never made it to the map. 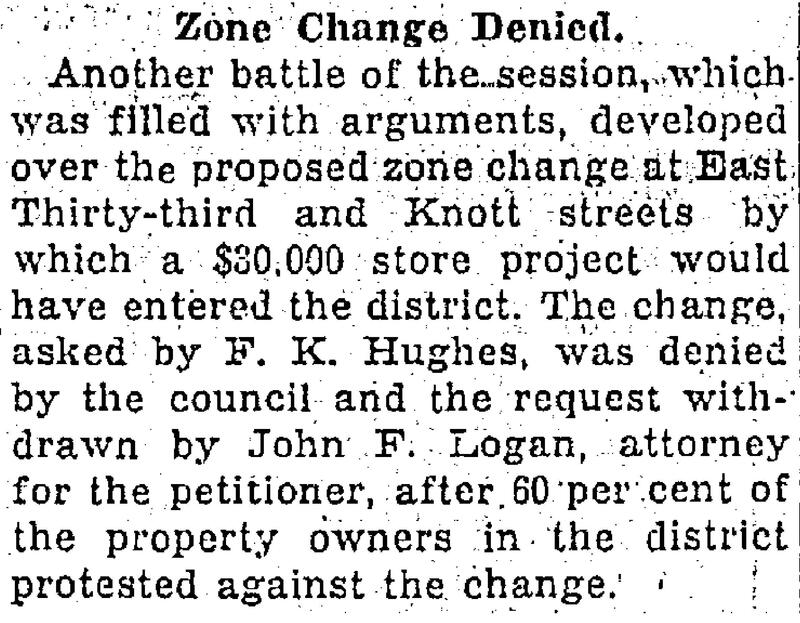 In fact, most locals never used the “Lincoln Park” name either, preferring the term Highland back in the day, and today’s King Neighborhood. From the mid 1920s until the early 1950s, the building was referred to as Grace and Truth Hall. Its most recent faith community was the Mt. Sinai Baptist Church, from the mid 1960s up until 2005. Following Mt. Sinai, the building was vacant for several years and like many older area churches was sinking under abandonment and deferred maintenance. It was bought by a private owner who lived in the old church for several years prior to its current incarnation as Portland Playhouse, a theater company. The first play in the church was 2008 and since then, Portland Playhouse has built a solid reputation for high quality and well produced shows, and a loyal following. Michael Weaver, Managing Director of Portland Playhouse, explains that the church has recently undergone a $2.4 million interior upgrade to better function as a theater, and to expand the theater company’s offices into the former fellowship hall in the basement and the former Shining Star Daycare, which was attached at the back of the church. While much has changed inside, the upgrade kept the bell tower, stained glass windows and much of the original flooring. “We wanted to honor the history of the building,” says Weaver. 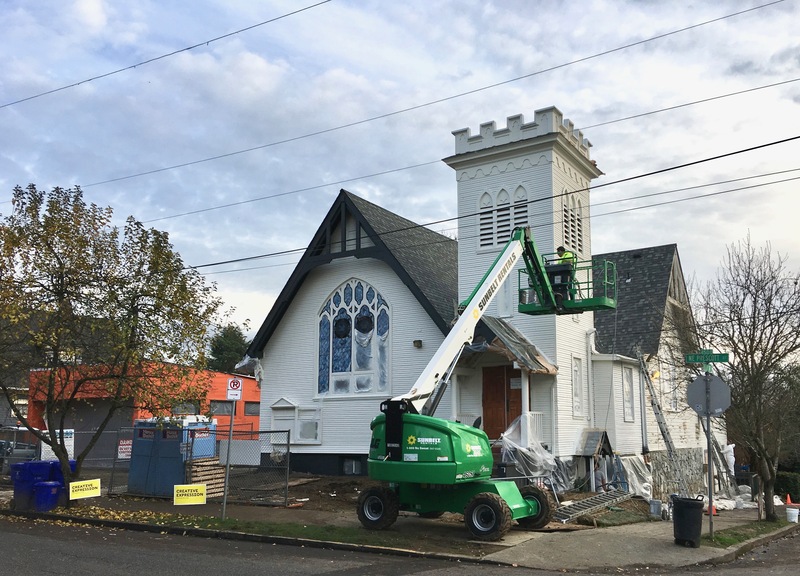 Check out this Portland Playhouse photo gallery to see a nice documentation of the renovation, and information about what’s playing (A Christmas Carol starts next week!). 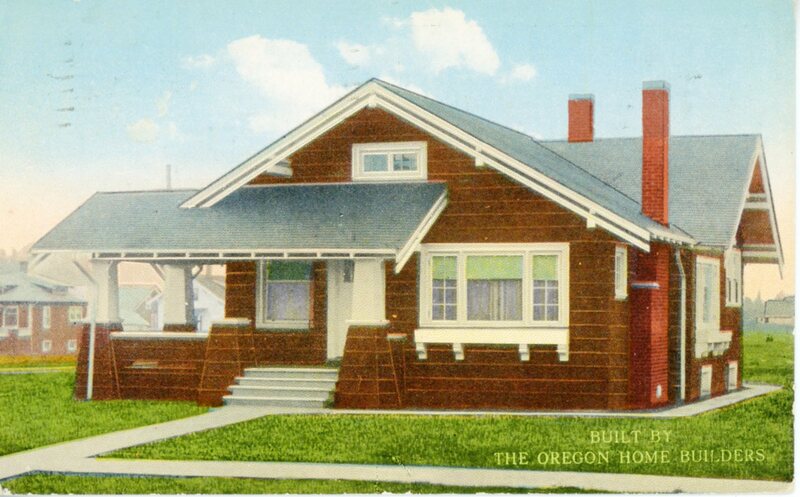 Still more than a month off, but plenty of time left to sign up for an Alameda neighborhood walking tour we’re leading on the morning of Saturday, August 11th for the Architectural Heritage Center. Here’s a link to more information and to sign up. 10:00 a.m. to noon on what we hope will be a sunny day. Pre-registration is required, and the cost of the program supports the Architectural Heritage Center, which is a great organization to support. 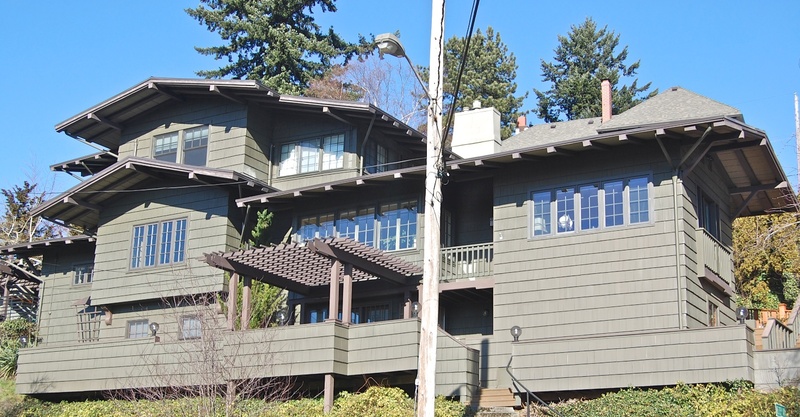 The blurb says “moderately strenuous,” but the trickiest part is walking up Deadman’s Hill, where we pause halfway up anyway to appreciate the George A. Eastman Arts and Crafts style home on the south slope. We’ve led tours like this in the past, both for the Architectural Heritage Center and for interested neighbors. 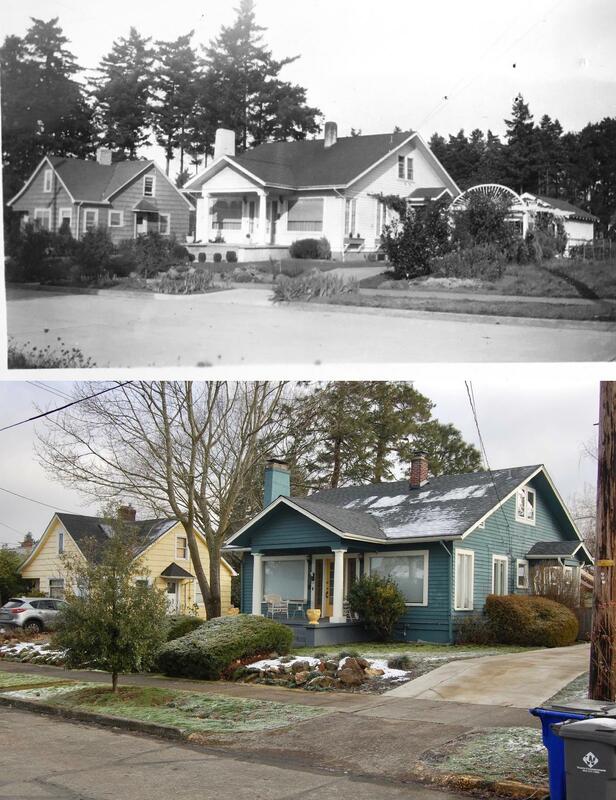 We love to explore the neighborhood with like-minded participants, and to share the many interesting history stories we’ve gathered up over the years. And of course you know our mantra: that understanding the past is the key to appreciating the moment and to shaping the future.